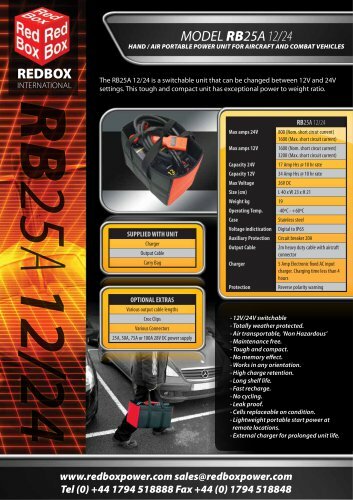 HAND / AIR PORTABLE POWER UNIT FOR AIRCRAFT AND COMBAT VEHICLES REDBOX INTERNATIONAL The RB25A 12/24 is a switchable unit that can be changed between 12V and 24V settings. This tough and compact unit has exceptional power to weight ratio. SUPPLIED WITH UNIT Charger Output Cable OPTIONAL EXTRAS • 12V/24V switchable • Totally weather protected. • Air transportable, 'Non Hazardous' • Maintenance free. • Tough and compact. • No memory effect. • Works in any orientation. • High charge retention. • Long shelf life. • Fast recharge. • No cycling. • Leak proof. • Cells replaceable on condition. • Lightweight portable start power at remote locations. • External charger for prolonged unit life.